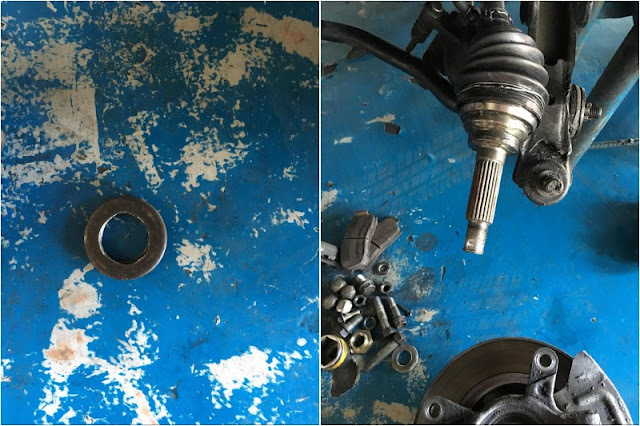 I'd like to share an ordeal with a car repair shop in Banawe a few months ago which I also shared over Reddit. Long rant. Please excuse me as I am not inclined with cars but I will describe it as accurate as I can. All monetary figures used are today's current exchange rate for the actual value from where I come from. To start with, I won't grill my SO for this (that was my original intention for going here) even if I sometimes dislike how he is such a cheapskate sometimes, wanting to always save money by choosing a less expensive option; that's the least of my worries now. What I don't like more are people who intentionally scam others for money. I don't want to say that this is quite common from where I come from (even if it is) because that will just justify what such people do. So we spent over $500 (exactly $546.69) for car repairs, particularly to replace a CV Joint along with other parts on a certain car shop. This wasn't the original shop we drove all the way there for (about 15 kilometers from where we live) but the authorized re-seller store was closed that time. I mentioned about calling in first before dropping by but he (the SO) was too sure since he already spoke with the store owner days before. The vehicle part we need is supposed to cost $75.93 each ($151.86) at this store. Another reseller quoted $238.63 each or that's $477.27 for both sides. I was leaning towards the latter since the other store is closed but it will mean another drive towards their location. Some guy recommended a store close by and so we tried. The owner assured us that they can fix it. The part we need was priced at $195.25 (both sides). What we didn't know was that they didn't really resolve the problem and only provided a temporary fix. I realized that this was the reason why they suddenly halted all types of work on our car even if they had nothing else to work on that time. They just pretended to go inside the shop and out again for some good minutes. They resumed work when we weren't looking because we were busy buying from a food peddler. Apparently, they added a spacer (this image - http://i.imgur.com/zK0z74T.jpg) in order to make it fit because they didn't get an exact match to this - http://i.imgur.com/6XOJiYi.jpg . It was working fine at the beginning and we were very grateful. We even gave them a generous tip. But something came up again after two months. If we used the car daily or even weekly (we don't), the issue may have resurfaced earlier. We heard some sort of grinding sound to which a mechanic nearby suspected as a possible wheel bearing problem. But he discovered the spacer above when we went back to their shop for the wheel bearing replacement. We talked to the first car shop about what they did. We also considered bringing it up to a local trade industry office for complaints but decided to bargain with the shop first. They refunded us with $130.16 out of the original total price. Now, we have paid a deposit of $216.94 to order the original part (CV Joint and wheel bearing) from a casa, an authorized seller of the car brand's parts from another nearby city. The balance (total is $670.35 including labor) once the parts are delivered. Yes, it may be time for a new car but this one is our memorable first and had been with us for about 8 years. TL; DR: Lost over $1k in bad car repairs and will need to spend more to rectify the problem. Banawe is a haven for con artists, thieves and all sorts of riffraff. However, there are still a lot of good shops over there that do provide authentic parts and good economical labour. I divide Banawe into 2 areas with the divider being Quezon Avenue. The E. Rodriguez side is more like a marketplace and is busier with all the shops in close proximity. I find this side to be dodgier though I do buy parts from this side. The other side heading in the direction of Del Monte has a lot of shops that are laid out in clusters so they aren't as spaced as closely as the other side. I find this side a bit better especially in terms of service. Mind you, both sides have a lot of petty thieves so never leave your things unattended or your doors unlocked. We were able to recover about 6,000 pesos from the original 9k price of the specific part in question from the store (Leo Val Car Parts & Accessories or so it says on the receipt) but the total amount paid is almost 25k. With the additional pay again through the casa (around 20k), it would have been enough for a new car down payment. What's even sad is the fact that they were very accommodating, friendly and conversational. You won't suspect that they were up to something. I wish they could have just said that they can't fix it instead of attempting to do so just to get a customer. I mean, they don't need to since there are a lot of car who frequent their shop. There were numerous people who came that day alone. Oh well, that's life. Lesson learned. A comment below gave a link to a picture of the place through Google maps. Same modus din nangyari sa akin kahapon lang.Gumagamit ng ibat ibang receipts at walang signboard ung shop nila basta katabi sya ng leo val auto supply and accessories.Bali nag post din ako sa pinoyexchange forum regarding ditto. Yung picture sa post mo in PinoyExchange, yan nga yun; that corner shop.